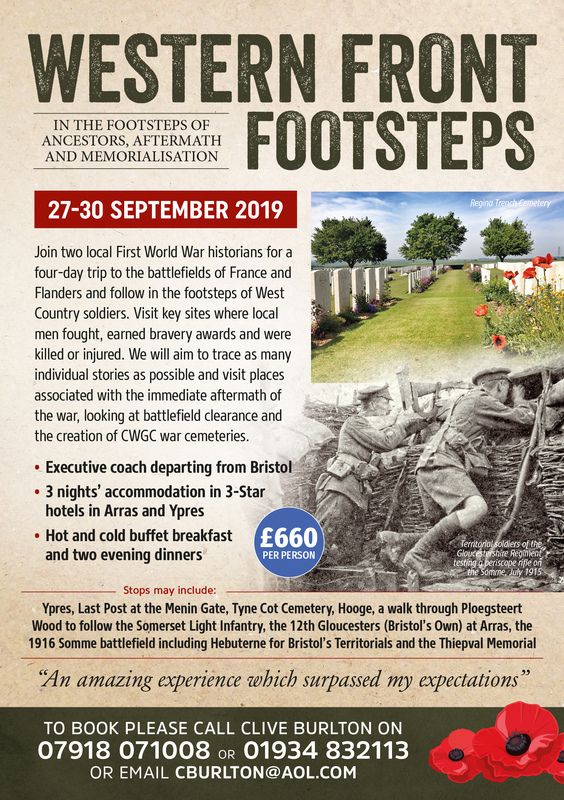 Following the success of the last three years of Bristol and West Country based battlefield tours organised with fellow historian, Clive Burlton, we are pleased to announce another trip for this coming autumn. 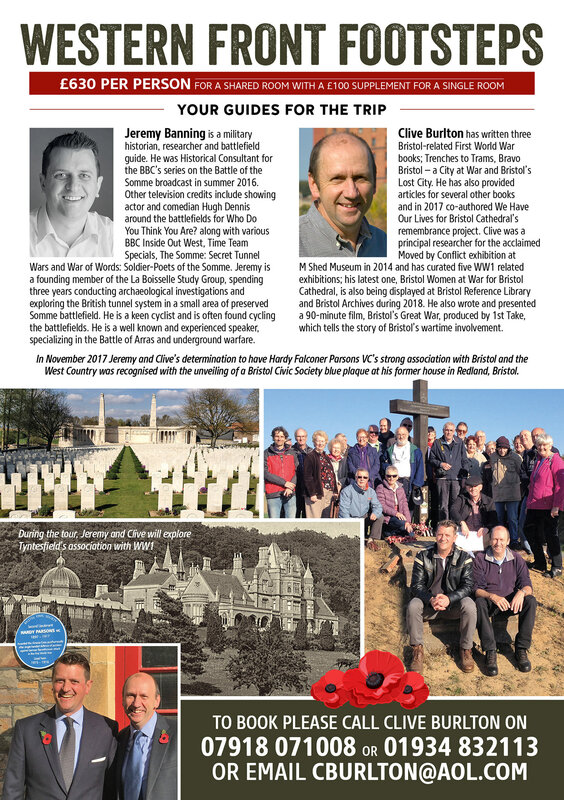 This time our focus is not solely actions by units from the West Country but a look at associated stories of the postwar period of battlefield tourism and creation of Commonwealth War Graves Commission cemeteries. Once again we are travelling with our partners at Bakers Dolphin. 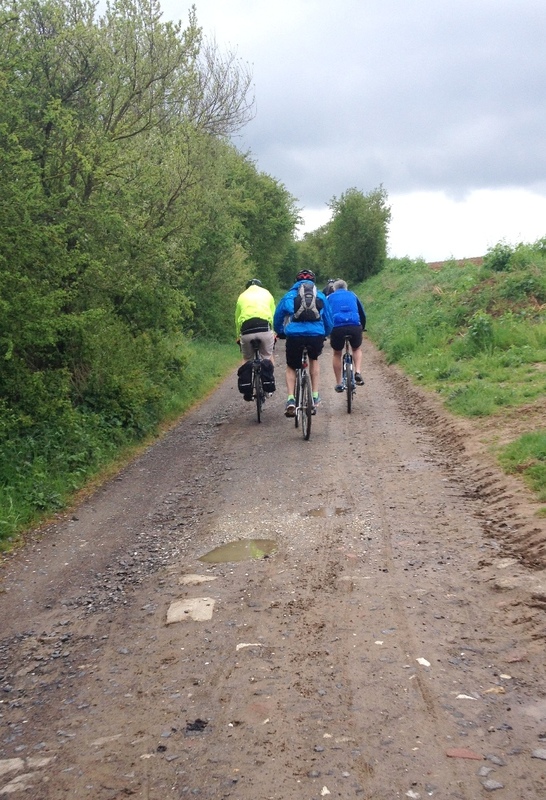 The three night, four day tour will visit key sites associated with the West Country. 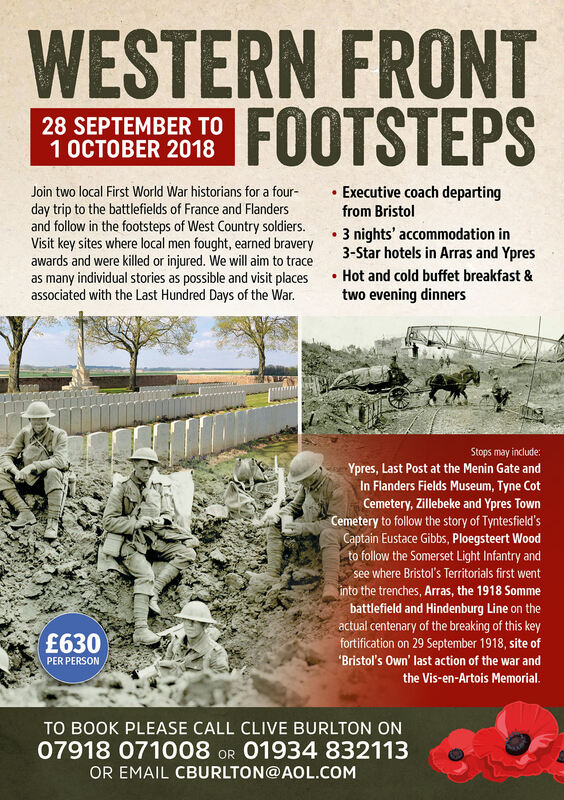 Travelling by executive coach we will depart from Bristol on 27 September and travel to Arras, stopping at sites of interest en route. 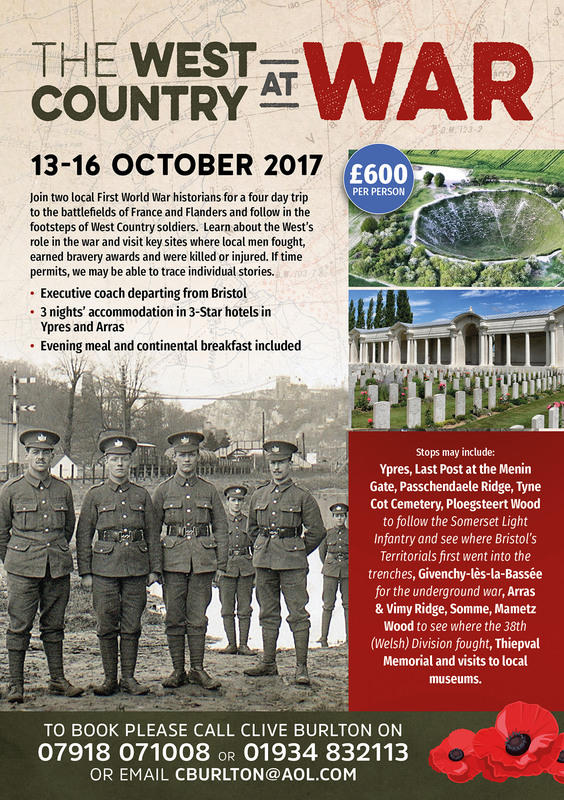 If time permits we will visit Fresnoy near Arras where the 12th Gloucesters (Bristol’s Own) fought with heavy losses in May 1917. 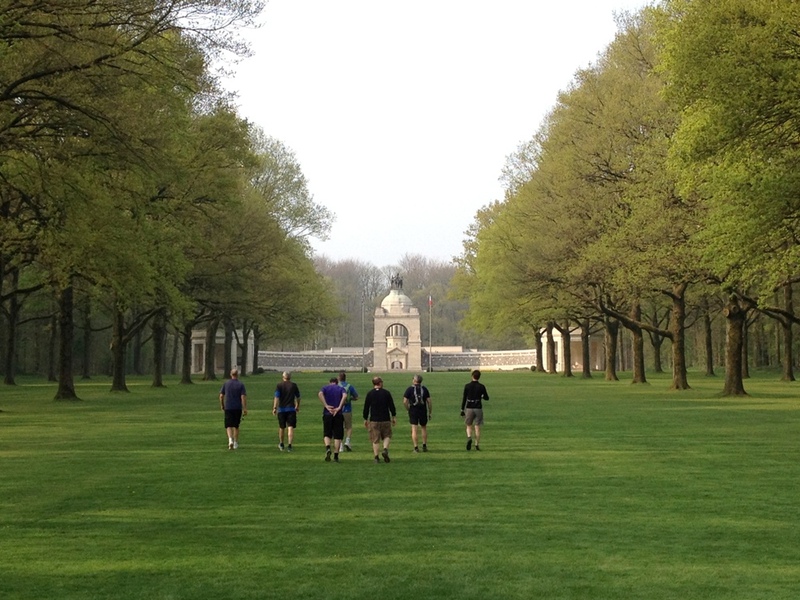 The next day will be spent on the 1916 Somme battlefield with a look at the Bristol Territorials at Hebuterne and a visit to key battlefield sites including the Thiepval Memorial. 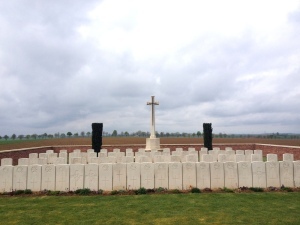 On our way down to the Somme we aim to stop at Mory Abbey Military Cemetery to hear a most moving story of a father’s love for his son. 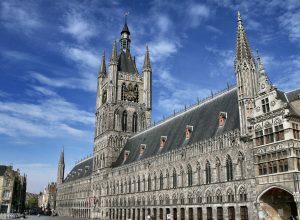 On 29 September we will journey northward to the sacred Ypres salient , the wartime cauldron for so many of Britain’s soldiers. 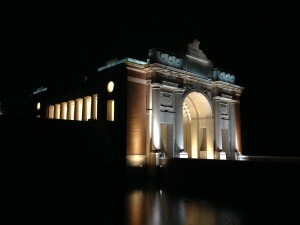 Whilst in Ypres we will attend the Last Post ceremony at the Menin Gate and walk in the footsteps of the 1st Somerset Light Infantry in December 1914 at Ploegsteert (known as Plugstreet to the Tommies). 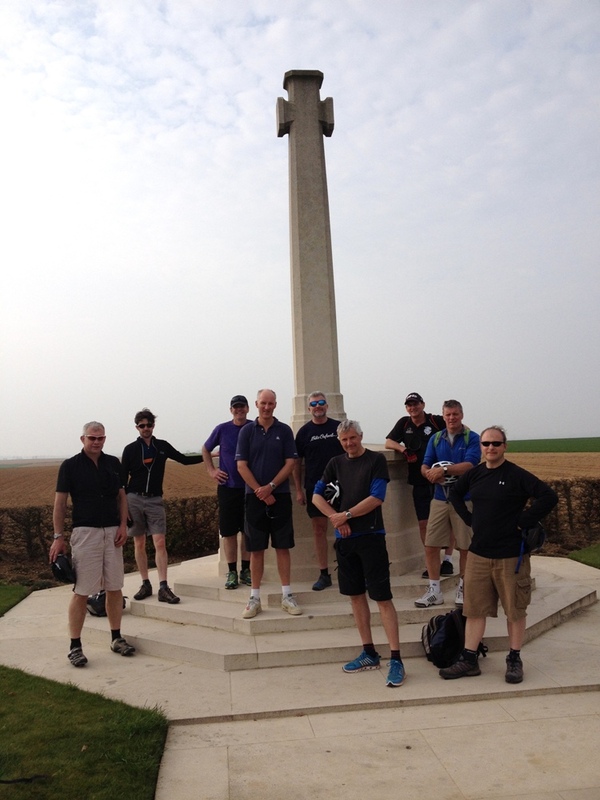 Other key sites around the salient will be explored. 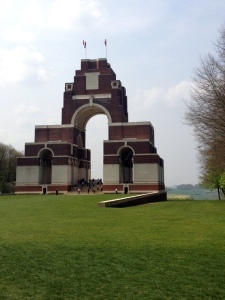 Throughout the trip we will be looking at the work of the war artists such as Nash, Levinson and Orpen. 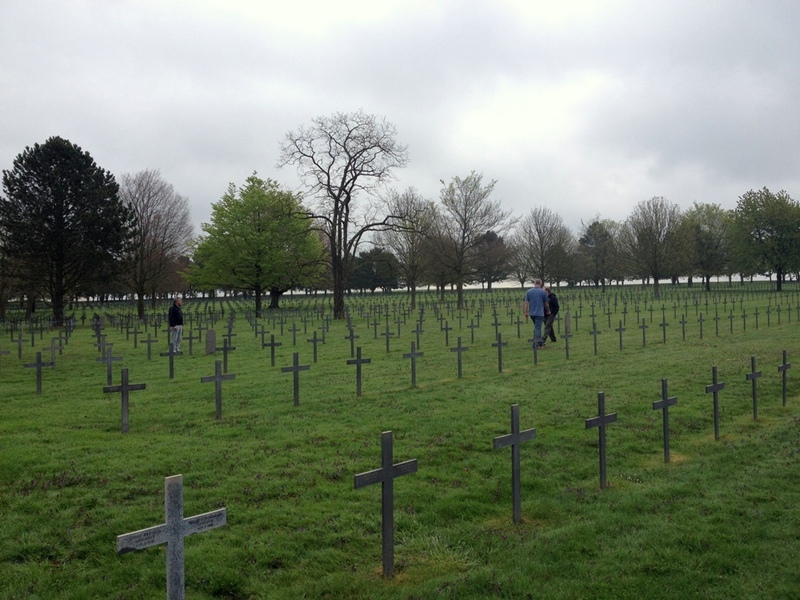 As ever, our tour is based around the stories of relatives of those who join us. 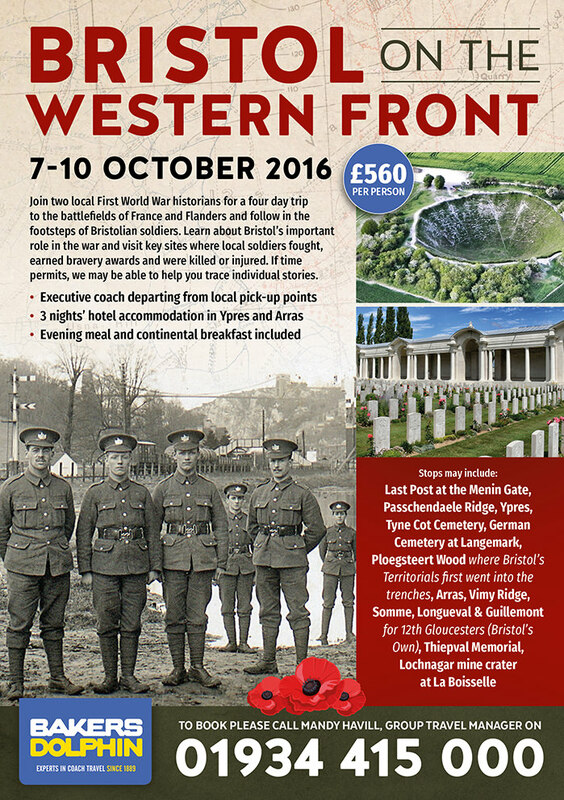 Please do send us details and we will endeavour to visit individual graves and battlefield sites. 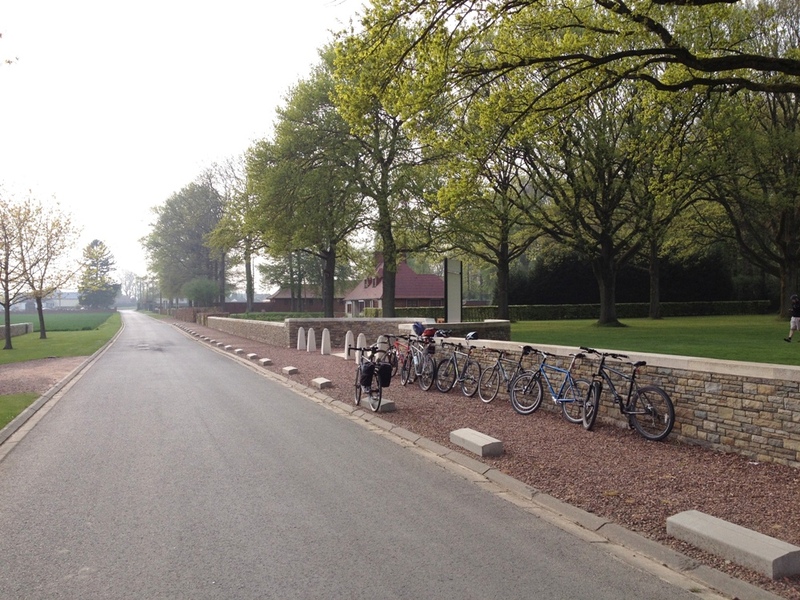 Monchy-le-Preux has long been one of my favourite spots on the battlefields. The tale of its capture and subsequent defence make fascinating reading. 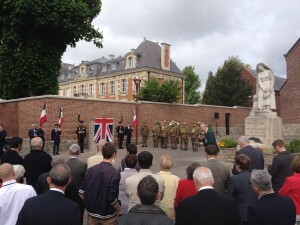 As such, I was delighted to take my group of battlefield clients to attend the unveiling of a new memorial to the 1st Essex Regiment and Essex Yeomanry in the village square on Saturday 21 May 2016. The memorial is the brainchild of Dr Ted Bailey, whose grandfather served in the 1st Essex Regiment. 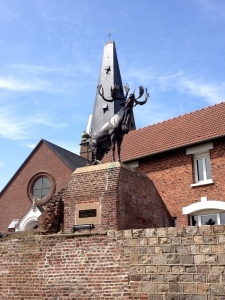 Monchy was chosen as the site for this memorial as it is forever associated with the losses sustained by the cavalrymen of the Essex Yeomanry who aided the capture of the village on 11 April 1917. During this action, Lance Corporal Harold Mugford held back the advancing enemy singlehandedly, although seriously injured. For his actions he was awarded the Victoria Cross. 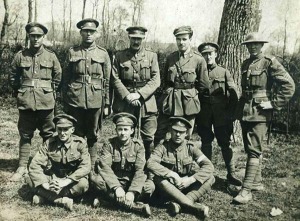 Three days later the 1st Essex Regiment and Newfoundland Regiment launched an ill-fated push eastwards up Infantry Hill. 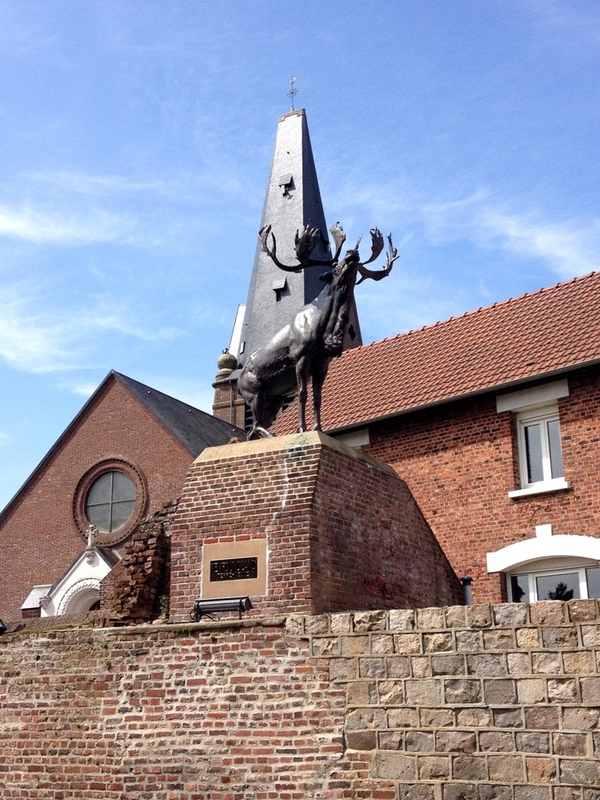 The Newfoundlanders losses are commemorated with one of their five caribou in the centre of the village. 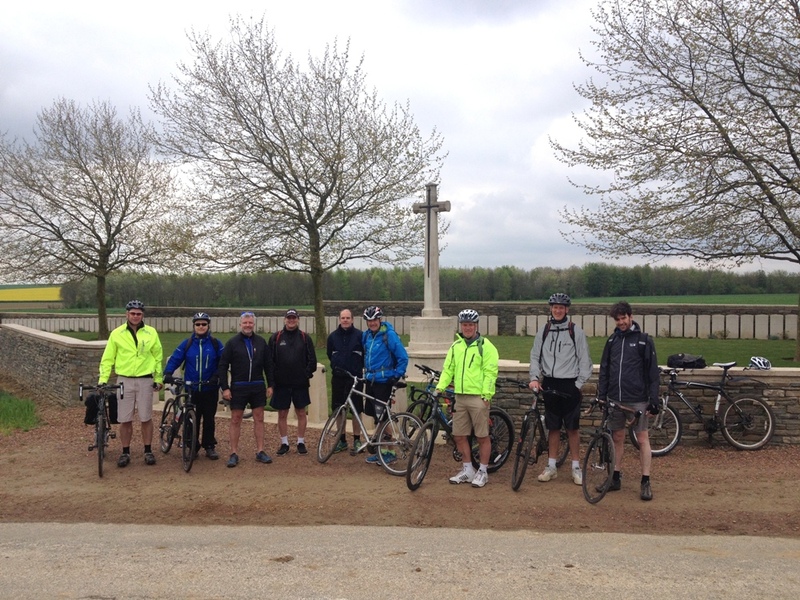 Dr Ted Bailey has sought to redress this imbalance with a memorial to the memory of the Essex Regiment and Yeomanry. 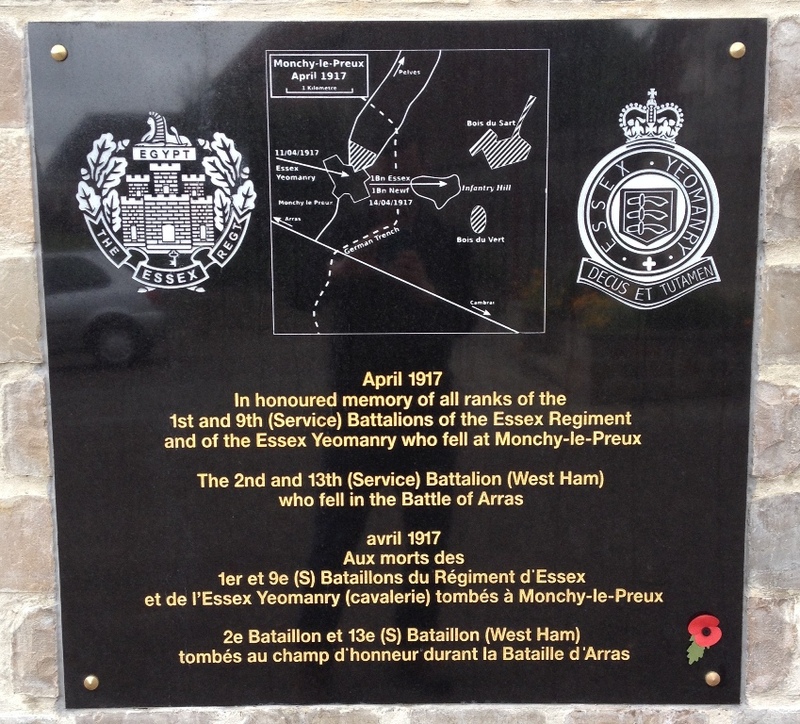 On 11 April, the Essex Yeomanry, as part of a mounted division, bravely attacked Monchy in a snowstorm, galloping into the village but were met with heavy fire and lost 135 men, 29 killed in action, and most of their horses. Machine Gunner Lance-Corporal Harold Mugford doggedly defended the position under severe enemy pressure although severely wounded in both legs which were subsequently amputated. He was awarded the Victoria Cross and survived the war with distinction. 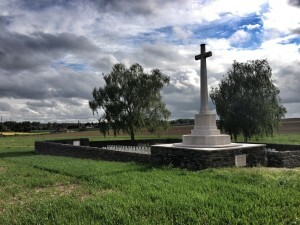 On 14 April, the 1st Battalion Essex Regiment attacked east of Monchy into a wooded area aiming for their objective, some high ground known as Infantry Hill. Initial success, with ground captured and prisoners taken, was reversed by a heavy German artillery barrage plus a simultaneous counter attack by the 3rd Bavarian Regiment, one of the enemy’s finest fighting units. 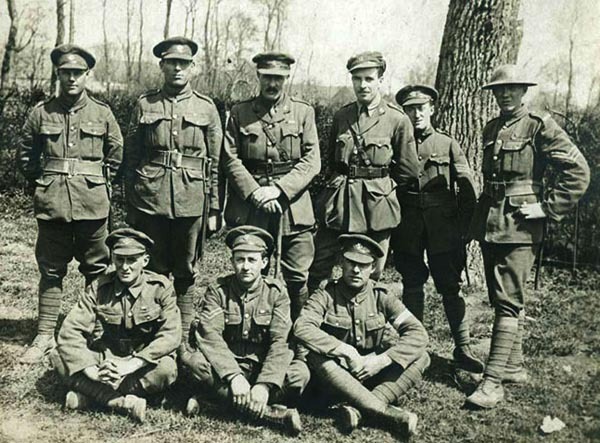 The battalion suffered 661 casualties, so many that a temporary battalion had to be formed with the Newfoundland Battalion, named the ‘1st Newfoundessex’, comprising only 400 men. 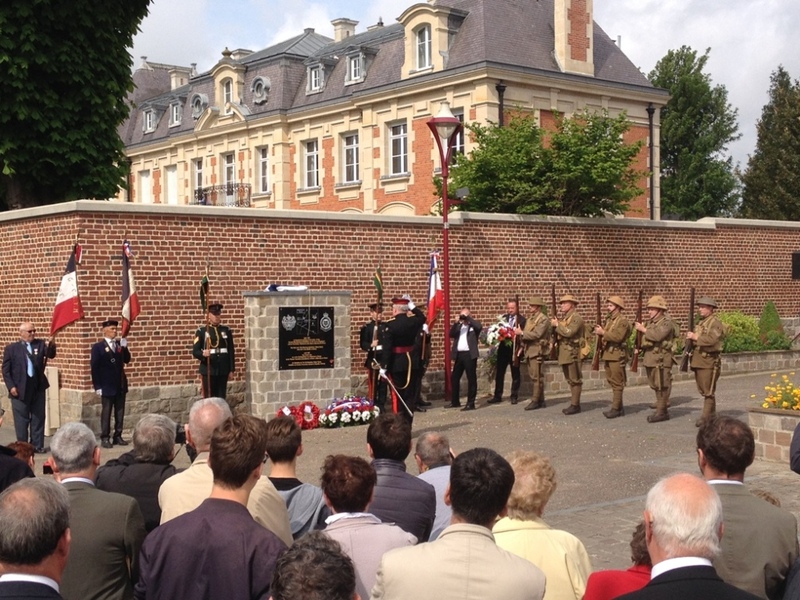 Other Essex Battalions were also in the vicinity during this larger Arras engagement. 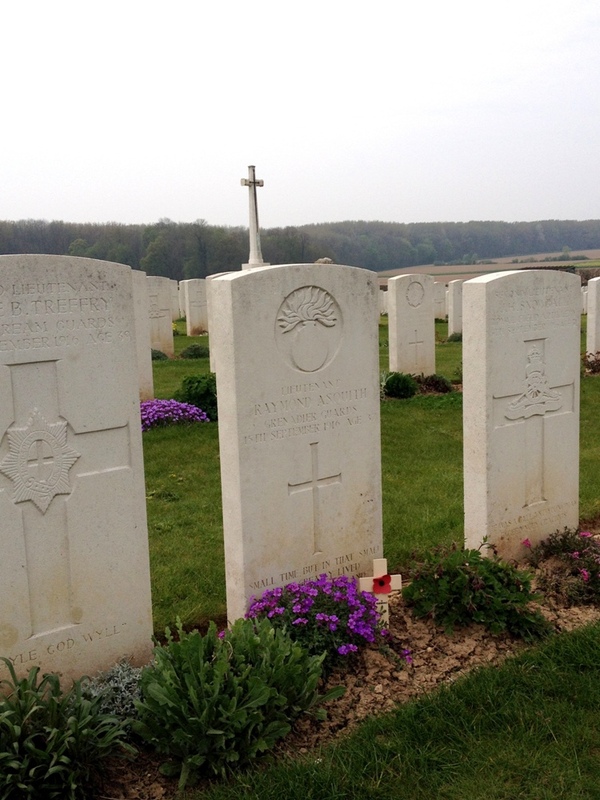 The 2nd Battalion was in action on 9 April losing 78 men whilst the 9th Battalion lost 163 men. The unveiling ceremony was very well attended with a long list of dignitaries from the UK along with a great many locals. 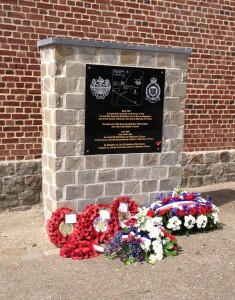 The memorial can be visited in the square outside the church just off the Rue de la Chaussy. It stands a mere 50 metres away from the Newfoundland caribou. Prior to the armistice period and a subsequent battlefield trip to the Somme I spent a day at Carlshalton Boys Sports College. I had been invited there by History teacher, Julie Haunstetter. What marked this day out over many of the other school visits I undertake was the commitment and interest shown by students. 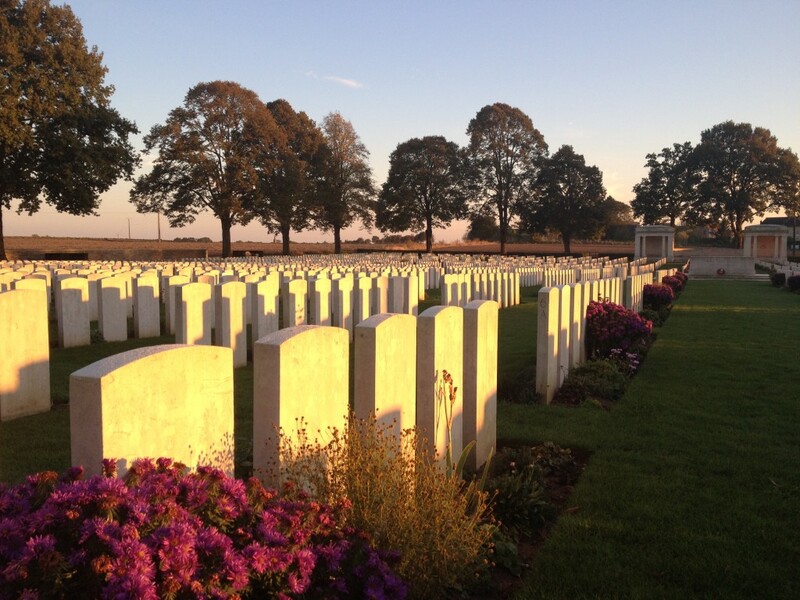 The school and history department had clearly vested a great deal of thought into the theme of remembrance in 2014 with one student Regan writing a heartfelt poem which has been added to a T-shirt to raise funds. This had been picked up by the BBC and Regan and a fellow student, Sam, had accompanied Julie Haunstetter on to the BBC Breakfast sofa. 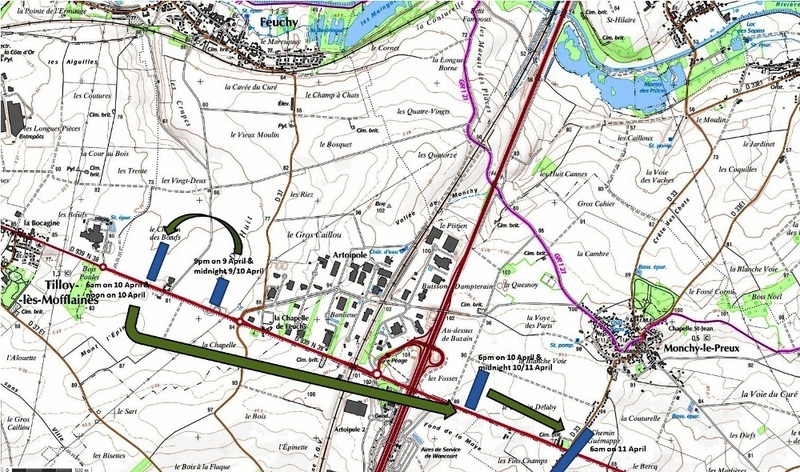 For my November visit we had planned a full day with sessions looking at a variety of topics including enlistment, training and life in the trenches plus a session on tunnel warfare and our archaeological work at La Boisselle. The most rewarding session was spent with higher ability students casting a critical eye over the use of sources. Over the past few years I have been horrified to hear and observe students simply relying on Google as a means to gather knowledge. I wanted Carshalton’s students to analyse why this was wrong and, as an example of flawed material, offered in a critical look at certain reference sources used in the writing of the Great War. 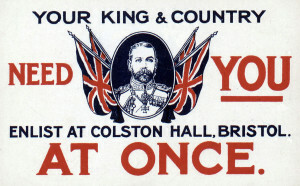 An obvious place to start was the British Official History (or to give it its full name, the History of the Great War based on official documents by direction of the Historical Section of the Committee of Imperial Defence). I explained the process in which versions had been compiled. Ongoing analysis has found many inconsistencies in these volumes. I was able to show the students examples of correspondence between officers and the official historian, James Edmonds, held under reference CAB45 at the National Archives, Kew. What soon became obvious to all was that no ‘Other Ranks’ were consulted whatsoever. The Official History is an officers view of the war. The rank and file had little or no input. Official History – truthful or flawed? Even more telling was the date that volumes were published. The two volumes covering 1914 were published in 1922 and 1925. Those covering 1918, the year of victory, were published before and even after the Second World War! For Volumes IV & V this is nearly thirty years after the events the books are chronicling. The drop in quality is clear to see and a study of the CAB45 records for 1918 show it was not always possible to rely on memories of ageing men. This prompted the students to think how best to write an accurate history. Next, I gave examples of falsehoods and exaggeration in British war diaries. I have been lucky enough to have been privy to the research that my colleague Peter Barton has gathered from German archives over the last few years. What the research shows is revelatory. Many hours have been spent on telephone calls discussing and cross-referencing the inconsistencies between British and German records. Put simply, one cannot find the truth if one doesn’t use all available sources. The histories we rely on – official sources – are not corroborative history. German records have been neglected horrendously over the last century. I was able to offer examples of inconsistencies in British reports that were taken as the truth when a simple cross-reference check of the records of the German unit on the other side of No Man’s Land would have provided a much clearer story; in short, a corroborative history. I also talked of the ongoing public and media fascination with Ypres and the Somme at the expense of any other Western Front battle. It was certainly something that got students and staff thinking…. 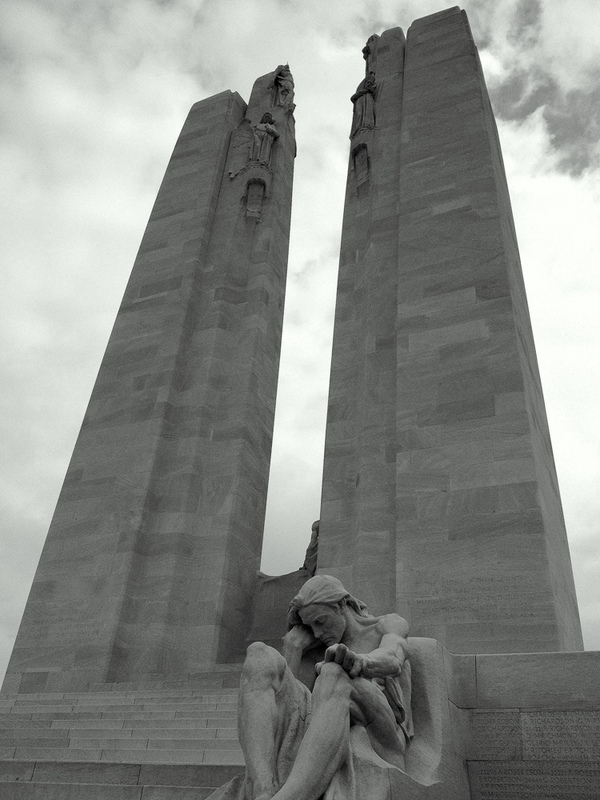 The day ended with an hours discussion and presentation on remembrance. Finally, I must say how brilliantly the Carshalton students behaved. They were a credit to the school and I look forward to the chance to visit again in the future. 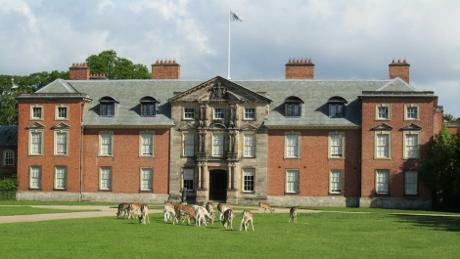 Earlier this autumn I spoke to the staff and volunteers at Dunham Massey Hall, a National Trust property in Cheshire. I had been approached some months before to help with their ambitious First World War project ‘Sanctuary from the Trenches’ which will see the hall will open its doors on 1 March 2014 as Stamford Military Hospital, the convalescent hospital in which 281 soldiers were treated between April 1917 and January 1919. Lady Stamford’s original plan to turn the hall over for use as a hospital for officers was altered, perhaps due to the sheer number of wounded men, and when the doors opened in April 1917 the hospital cared solely for ‘Other Ranks’. My role in this project was to interpret the wealth of material gathered by the team of volunteers, pick a representative sample of men from those chosen and use their stories in a lecture to not only explain the conduct of the war in 1917-18 but also elaborate on the daily routine of trench warfare, evacuation of sick and wounded and medical treatment received by the men. The information uncovered by volunteers was prodigious; there was no shortage of material related to the soldiers’ stay at Stamford Military Hospital. What was lacking was an appreciation of where those men had come from, in what actions they had fought and been wounded and what happened to them after their recuperation. 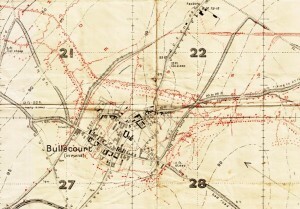 Bullecourt trench map extract. 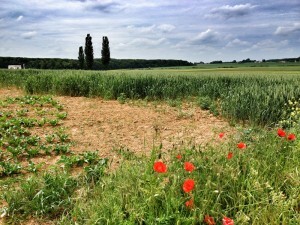 Two of the men who recuperated at Stamford Military Hospital were wounded here on 3 May 1917. 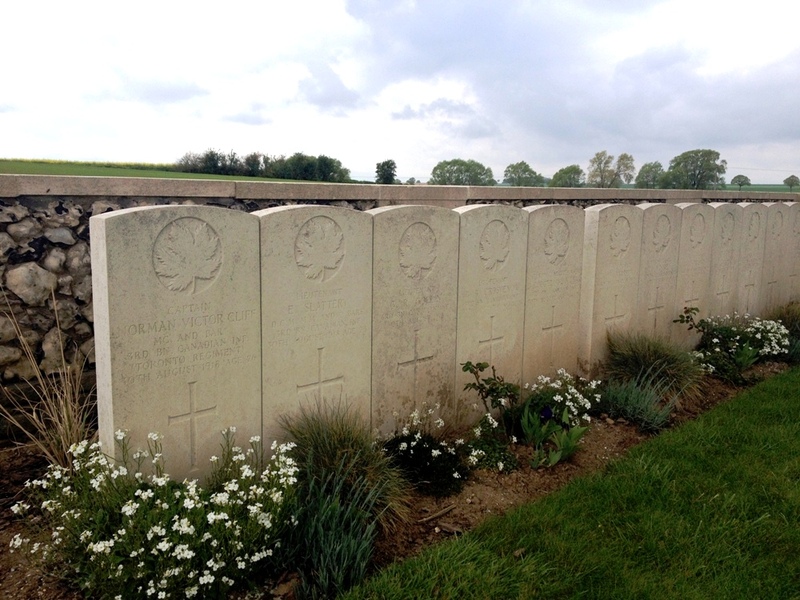 Casualties studied included a man of the 11th Rifle Brigade wounded near Havrincourt Wood in the push to the Hindenburg Line in early April 197, two men caught up in the Hindenburg Line itself at Bullecourt in May and a French Canadian wounded on Vimy Ridge. 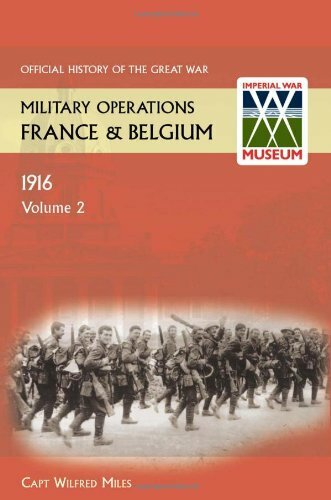 I was also able to use descriptions from my research into the Battle of Arras to illustrate the actions at Fampoux and Roeux in which a soldier of the 2nd Duke of Wellington’s (West Riding) Regiment was badly injured. 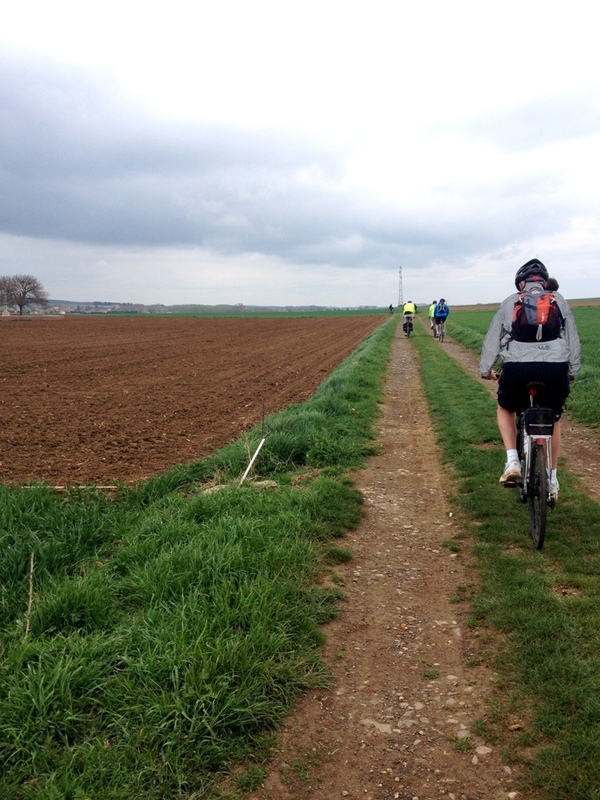 Moving northwards to Flanders I was able to look at the Battle of Messines (June 1917) with Private John Ditchburn, 9th Yorkshire Regiment, wounded close to Hill 60 on 7 June and two further casualties from the Third Battle of Ypres. Sources used included Medal Index Cards, Service Records (where available) and Census Returns. 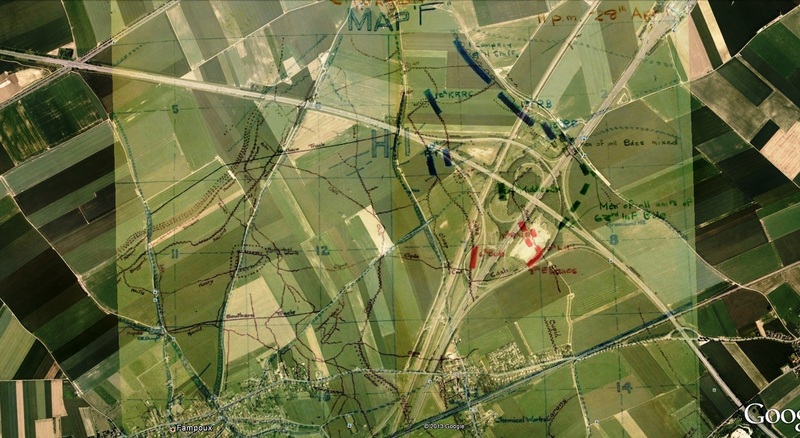 By scouring Brigade, Division and Corps files I was able to find appropriate maps to illustrate the exact area where the men had fought. 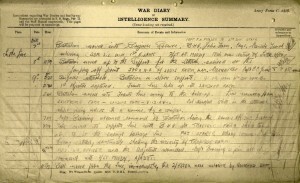 War Diary extract from 2nd Duke of Wellington’s (West Riding Regiment) for October 1917. 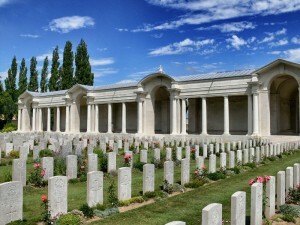 One of the men who had been wounded at Arras, recuperated at Stamford Military Hospital, returned to the front and was killed in the Passchendaele offensive. I was also keen to include soldiers wounded whilst not taking part in any major set-piece battle but in the daily business of merely ‘holding the line’. This offered a good opportunity to show the limitations of available documents. None of the men I researched were named in unit war diaries and so, in many cases, it was an educated guess as to the site of his wounding. Private William Johnstone, 1st Gordon Highlanders was hit by shrapnel in spring 1918 close to the city of Arras but from sources available I was unable to identity which day. His was a particularly sad story; after recuperating for over two months at Dunham Massey he was found to have shrapnel embedded deep in his head. Over time his condition deteriorated and he died of a cerebral abscess in hospital in Manchester. The final man I focussed on was even harder to research; Private Jenkins of the 1st Gloucestershire Regiment was wounded at some point during the autumn of 1918, the ‘Last Hundred Days’ of the war. His full identity remains unknown with neither christian name or regimental number noted in the records extant. I was keen to contrast this with some of the earlier soldiers I had researched where I had been able to provide highly detailed information. Having prepared the research on these men I spoke at Dunham Massey Village Hall to two groups of volunteers on 18 September. I was heartened by the audience’s reaction, not only by the enthusiasm shown but also the interest in the men and the ‘Sanctuary from the Trenches’ project. I look forward to returning to Dunham Massey to see how the information has been used and what the ornate saloon will look like with furniture replaced with stark hospital beds. I would like to thank Charlotte Smithson and all those who work and volunteer at Dunham Massey for their help and enthusiasm with this project. Our forthcoming project Sanctuary from the Trenches; a Country House at War tells the story of how Dunham Massey Hall became the Stamford Military Hospital, caring for 281 soldiers. Our collection gives us some information about the soldiers that stayed at Dunham, but we wanted to know more about their lives before they were treated here. Using our archive and other resources, Jeremy pieced together their stories. Jeremy’s respect for those that fought during the First World War made for a heart-warming lecture. He talked us through what our soldiers had experienced and left us feeling fondly affectionate for the brave souls who were cared for here. Over 100 volunteers attended the lecture and it was a big hit with them all – they haven’t stopped talking about it since. It provided the background of information for our volunteers needed in order to contextualise the Stamford Military Hospital’s role in the First World War. We’ll be asking Jeremy back, without a doubt! 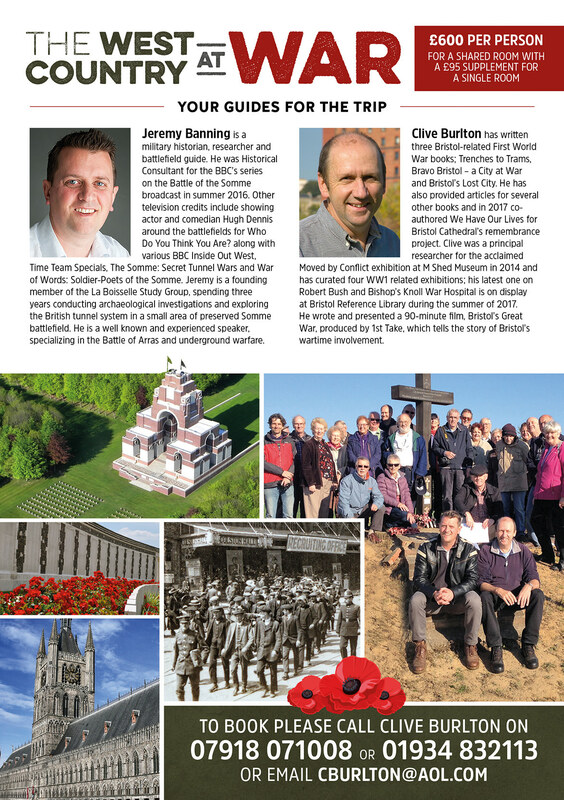 ‘Jeremy Banning’s knowledge of the First World War is second to none and he is as good a presenter as you could wish for. A star attraction, I would suggest. So to have him come to talk to us Volunteers was a real treat. 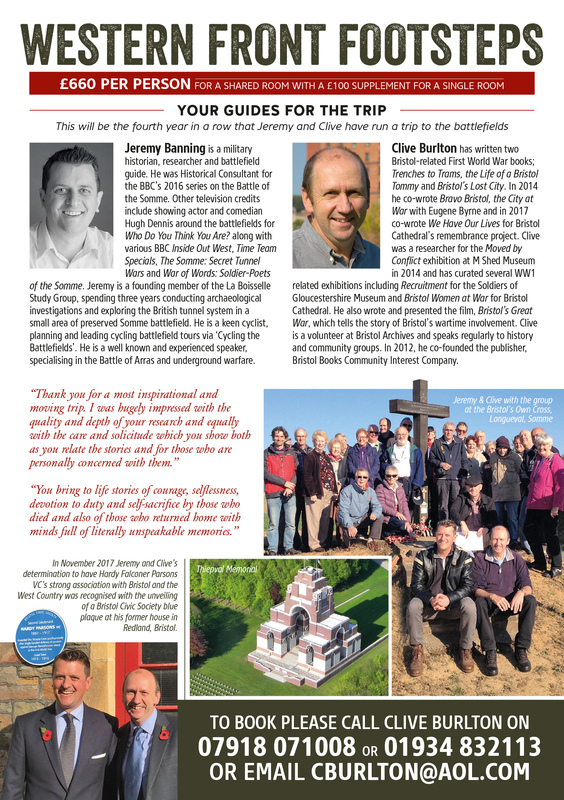 The presentation was so revealing and full of fascinating tales of soldiers directly connected to our Property’. 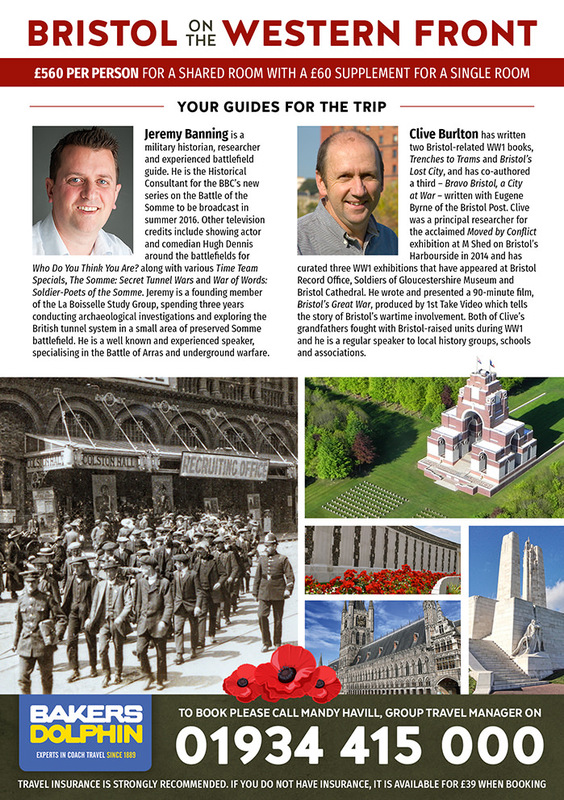 Copies of ‘Arras – The Spring 1917 Offensive in Panoramas including Vimy Ridge and Bullecourt’ and Richard’s ‘Boy Soldiers of the Great War’ will be available to buy. 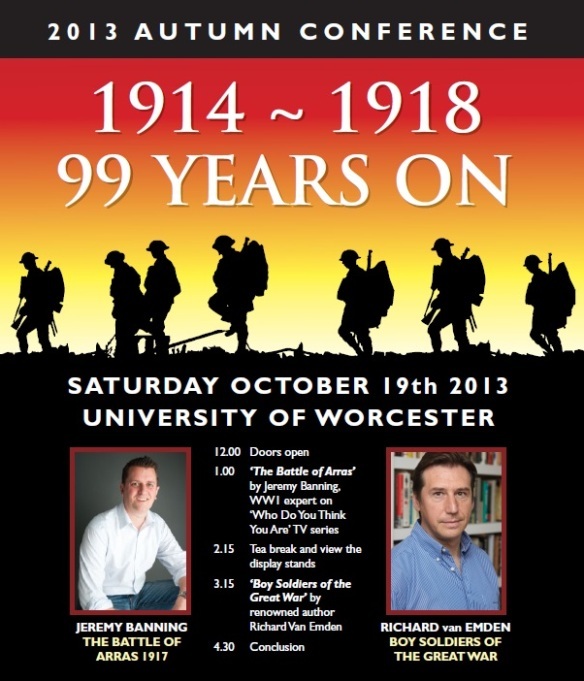 To buy tickets please call the Worcestershire & Herefordshire Branch on 01905 774797 or e-mail whb.wfa@hotmail.co.uk. The deadline for bookings has now been extended to 4 October. 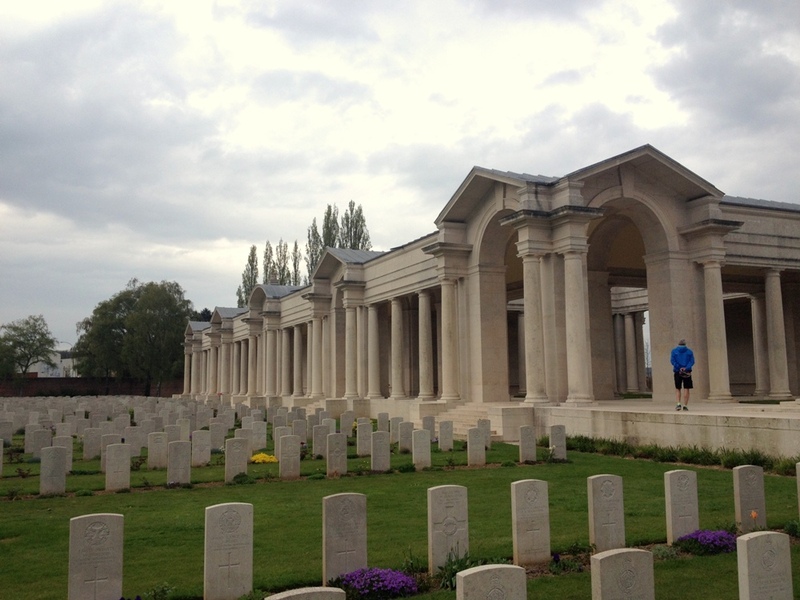 I recently led a one day trip to the Arras battlefields for three generations of a soldier’s family (nephew, great-nephew and great-great nephew). I had been asked to research the actions of Private Horace Pantling, 10th Battalion Loyal North Lancashire Regiment around Arras. Horace’s Battalion formed part of 112th Brigade, 37th Division and will be forever known with the actions on 11 April around the small hilltop village of Monchy-le-Preux. After a general briefing on the battle and a visit to the Carrière Wellington to take a tour around the underground system we headed out on the battlefield, starting on the British front line on 9 April 1917, the first day of battle. 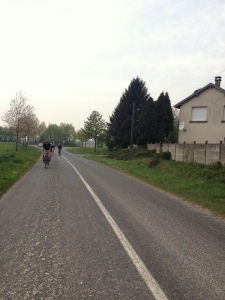 Following the arrow straight Arras-Cambrai road I explained the attack British assault up to the Brown Line near Feuchy Chapel. 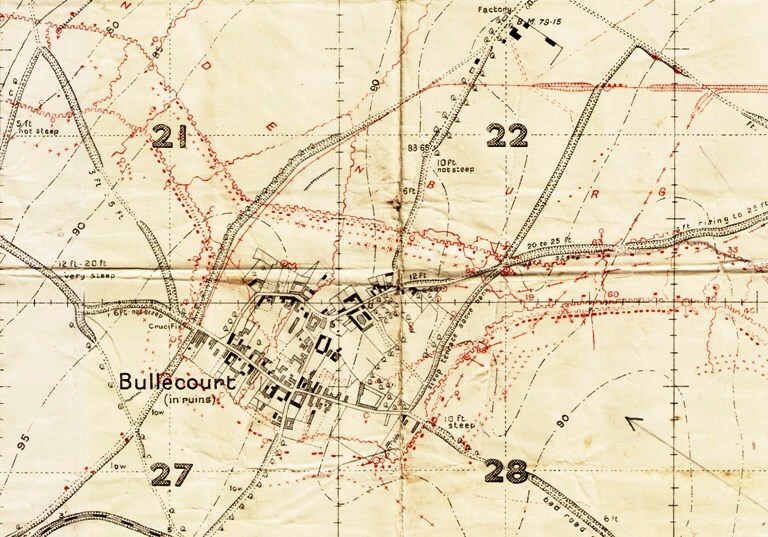 From then I was able to use a series of maps from the 37th Division files that showed positions of units every three hours for the first three days of battle. 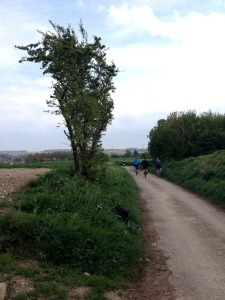 We followed the 10th Loyal North Lancs in their advance up the road in the early morning of 11 April. 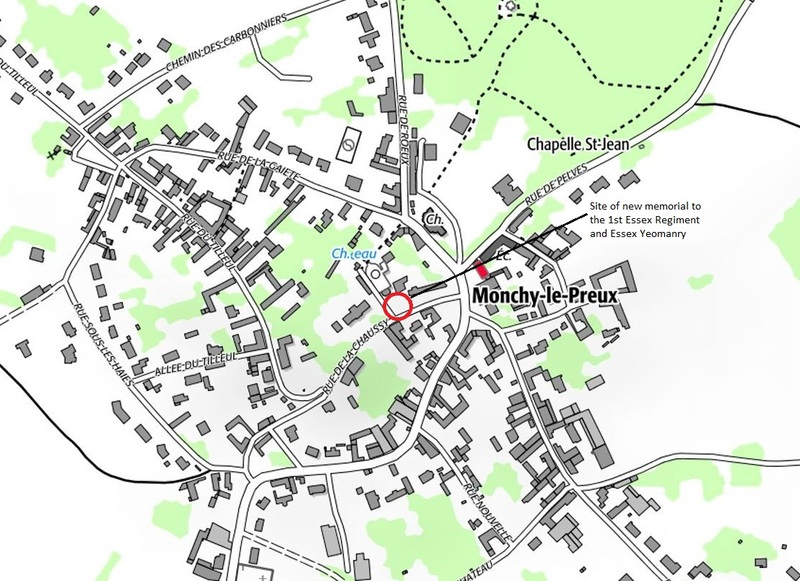 With the neighbouring 111th Brigade attacking the village of Monchy it was down to the 112th Brigade to take the Green Line to their right. 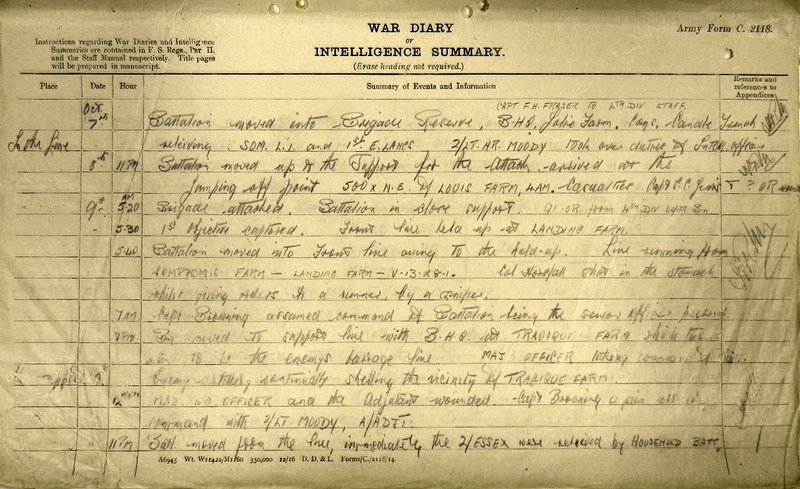 The Battalion war diary records that on moving to their assembly positions for the 5.30am advance the 10th Loyal North Lancs immediately were ‘met with very heavy Machine Gun and Shell fire’. 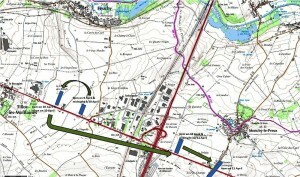 However, their assault on the trenches around the La Bergère crossroads was successful and positions were consolidated. Casualties were estimated at 13 Officers and 286 men for the Battalion’s part in the opening stages of the Arras offensive. 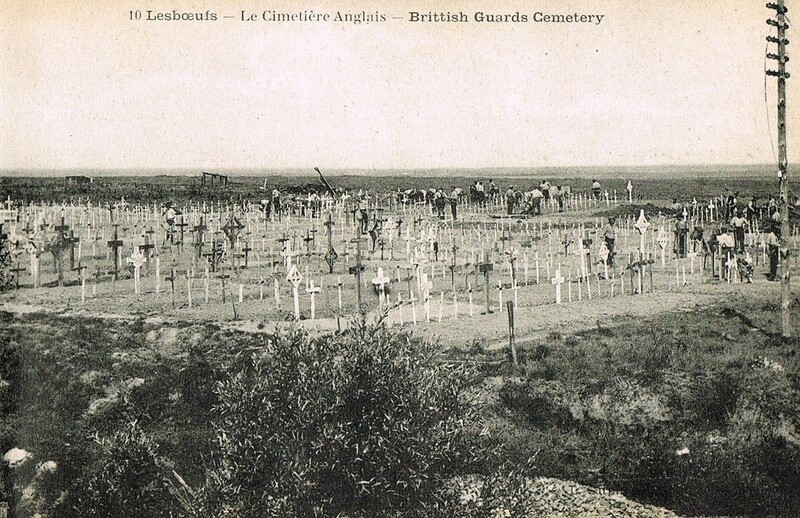 A number of the Battalion’s dead now lie in the nearby Tank Cemetery. 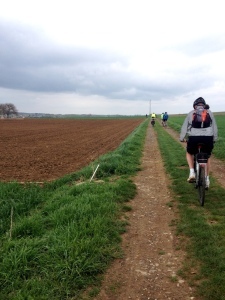 As we looked over the gently rising fields near Monchy it was hard to imagine the scene in the early morning of 11 April 1917. 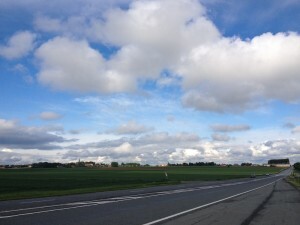 We had been blessed with a clear, spring day. The British troops who performed so magnificently that day 96 years ago did so with heavy snow and a chill wind across the battlefield. Having been taken out of the line for a rest they were next in action on 23 April during the 37th Division’s assault on Greenland Hill during the Second Battle of the Scarpe. The war diary made grim reading with very little gain possible owing to the German occupation of the Chemical Works at Roeux on the right. On the 27th orders were received to attack Greenland Hill at dawn the next day. At 4.27am on 28 April that Battalion attacked and reached a trench that had been begun by the enemy. The war diary records that ‘By this time the Battalion had suffered heavily and only one officer was left’. 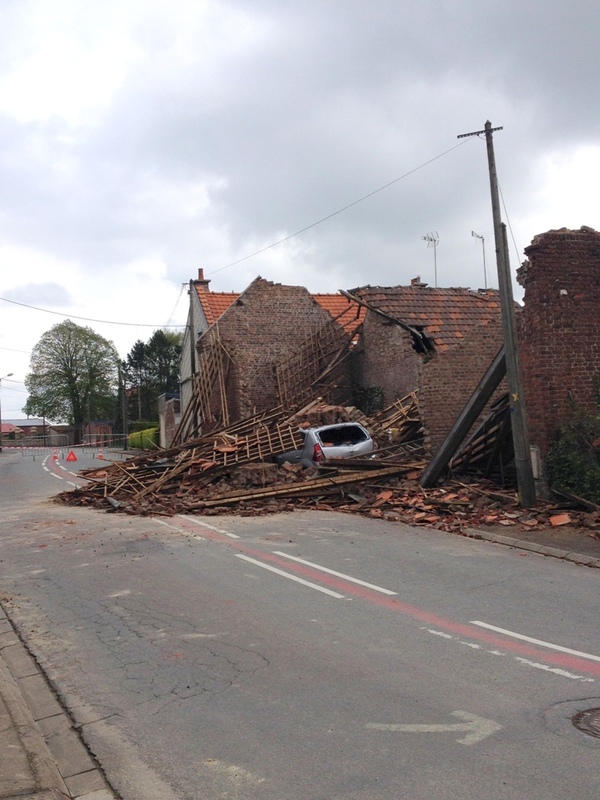 Once more suffering from enfilade fire from the Chemical Works, the Battalion dug in. The attack was yet another failure in the face of superb German resistance. It was during the actions on the 28th that Horace Pantling was killed. Horace, like so many British killed in the latter stages of the Arras offensive, has no known grave and is commemorated on the Arras Memorial. 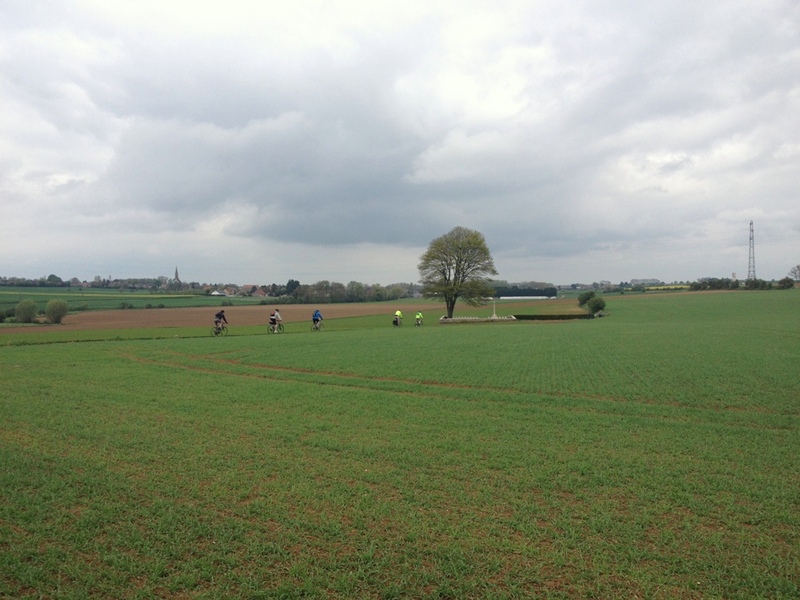 We were able to stand close to the positions where the 10th Loyal North Lancs assaulted and then, after a circuitous journey walk close to the spot where the Battalion dug in. It is one of those strange twists of fate that the junction of the A1 and A26 motorways now stands slap-bang right on Greenland Hill. Only by heading toward Plouvain and turning down a narrow track could we get close to the spot where the Battalion ended up. Sadly, the exact spot is now accessible only by driving on the slip road from the A1 to join the A26. We had visited Horace’s name on the Arras Memorial earlier in the day so it seemed a suitable place to end the tour. What struck me, as ever, was the small distances – easily covered in a minute or two in the car – that took so much effort to capture and consolidate in spring 1917. The British casualty figures for the Battle of Arras make sobering reading; 159,000 casualties in 39 days – averaging 4000 casualties per day. 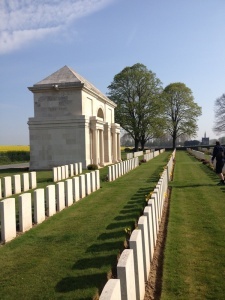 Despite countless visits to the battlefields such scale of loss in concentrated areas still both appals and moves me. 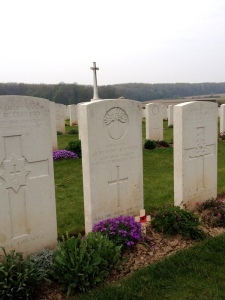 Horace Pantling was one of those casualties but his name is certainly not forgotten and three generations of his family now know the ground over which he fought and was ultimately killed in April 1917. A superb resource for those interested in the 10th Loyal North Lancs is Paul McCormick’s website http://www.loyalregiment.com/.